In this article I will show you how to install cement board using methods that are simple and will save you time. I will also reveal many tips that will help you through the areas that most people struggle with. These tips will guide you passed these problem areas and you will have a much easier time installing cement board. I also will show you how to avoid the #1 mistake people make when installing cement board. 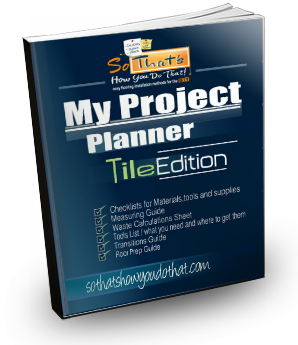 This mistake can cause a complete tile installation failure, causing loss of money and time! With the right guidance, learning how to install cement board is actually a pretty easy task. There are a few tools that you will need when installing cement board. Some of these tools you might already have. If you don’t, this is what I would recommend. Click on the links to see examples of the specialty tools. There are a few supplies that you are going to need when installing cement board. You can get all of these from any of the major Home Improvement Stores. I do HIGHLY recommend using Durock Next/Gen. This is a brand of cement board that I use for all my tile installations. It’s a great product and it cuts very easy. It’s also been around forever and I have never had an issue with it. There are many tools and supplies that are out there for you to buy. I know it can be hard to choose what you need . I have a guide that will show you everything I use and what I recommend. First measure the area that you are going to need cement board. I always try to split the area into squares to make measuring so much easier. If you have a room that has a lot jogs in it, then measure those separately, that is what I mean when I split the area into squares. In My Project Planner- Tile Edition I have a section that explains this very well and there are diagrams in there for examples. You need to get a total square footage of the area and then add five percent to the total. Most sheets of cement board are 3 X 5 which is 15 square feet. 15 divided into 84 = 5.6 sheets. You would need 6 sheets total. Before we go any farther on how to install cement board, I am going to talk about a very common mistake most people make. It is very important to first spread thin set on the floor before placing the cement board to the floor. Then you attach the cement board with screws. This step is crucial because it strengthens the floor and it helps prevent floor movement. Which will help prevent the tile from cracking. Now it’s time to start installing the cement board. In this step, I only take out a few pieces of cement board at a time. I do this so it goes back in the exact place that it was in before I moved it. Once it’s out, I then spread thin set onto the floor. Then, I put the pieces back into place and screw the floor every six to eight inches. In this last step you need to tape and fill the joints. It’s a good idea to use a tape that is meant for cement board, since it is designed for this application. I would only fill the joints that run in the length of the cement board for now. When you install the tile then you can fill the cross joints as you go. The reason for this is, the cross joints are not beveled and if you fill them now you could get a hump in the floor. This can then cause a tile to be higher than the other tile. Here is another video on how to install cement board. Thank you for reading this post and please leave ask a question or leave comment below. Question for you. How do I install cement board without 2 x 4s? I have demoed a 1961 shower and found steel strips but no wood. Do I need to install 2 x 4s to get the cement board to stay tight? I have not found any videos of this. Thank you! Can you share a picture or two for me to better answer this. You can email me or share it on my facebook page. Here is my email. There is a link to my facebook page on the home page of my site. Install the rough side up!Tracy are you a member of tile university? If not check it out. My best videos are inside and ready to watch. Let me know if I can help with anything else! Should cement board be used for floor base over solid cement exterior home entryway landing with steps location? Need to get a 1/4″ drop back (entry door) to front. Use thinset on both cement board and ceramic tile being used to create this drop? If cement board used for this purpose I assume it needs to be sealed…Great web site. I would use ditra xl made by schluter. It is a great product and I think its exactly what u need for this situation. I am about to tile my victorian terrace hallway. The existing floorboards are fixed and sound and i plan to lay thinset and then Hardie Backer as the base. The floorbards are sqaure edged planks and there are gaps+/- 3mm between many of them. Should i fill them with caulk or slivers before the thinset layer? No those will fill when you install the cement board. I have a tile floor under a wood stove that has been in place for forty years and hasn’t cracked. I installed a new base layer and oak floor around that area where the tile is, so my tile is now 1.5 inches below the new wood floor. I was thinking about putting down cement board and new tile over the old tile to get the floor levels to be close, enough that a transition threshold would work. Can I put the cement board directly on the old tile? If so, screwing the cement board down seems like it would be a challenge. What are your thoughts on the best way to do this? I would use ditra made by Schluter. This will take the place of the cement board. I recently was working on putting backer board on subfloor in bathroom. I was not aware I needed to put thinset down before the backerboard. I used hardi screws (probably more than needed), but it is going to be an issue on using thinset before the hardi board was put into place? This how I will answer. I would never install backer board on the floor without using thin set under it. It gives it added strength. However…… I have seen many tile installations hold up for years that were only nailed or screwed down. The ball is really in your court to decide if you want to risk it or not. Sounds like they hacked it in to me. That is not the proper way to do it. They will fill it with thinset and it should be OK but I would be concerned with what other corners they are gonna cut. Hi Joe. Once you put down the Durock, leaving a 1/4″ gap around the perimeter as instructed are you supposed to fill the perimeter gap with caulk? If so what kind? If not, is there a potential problem when the next layer of mortar goes down (and fills the gap) when you lay your tile? Thanks for your kindly response. Leaving a gap is more for you not having issues with installing the cement board. It makes the easier to put it in and take it out during installation. However if you have a fiberglass tub hold it back an 1/8 of an inch and fill it with caulk. Thank you for your quick reply – you are a gentleman and a great help. Hi Joe, I’m enjoying your videos! I’m tiling a small 5 x 5 ½ ft. bathroom floor. The plywood subfloor slopes and I’d like to level it with modified thin set. It’s ¼ inch low at the lowest point. Is is okay to level it with thin set? Should I level the floor first, let it cure, and then apply thin set to set the backer board? In other words, do it in two steps, not try to build up the thin set thicker in the low area when I’m installing the backer board? Is 24 hours adequate cure time? Sounds like you know what your doing g to me. Yes I would do it that way. Well I’ve never leveled a floor before and I’m nervous about doing it. Do you think the following is a good strategy? I’m thinking of using a 4 foot level to run 3 rows of screws along the floor keeping the heads all level. I figure the three rows of screws will allow me to pull a screed board and the screws will act like rails. I figure I can just leave the screws embedded in the cured thin set when it’s cured. Do you think that would work? Thanks in advance! need to stay on my email list, just download the planner, watch the videos and unsubscribe if you want. Do i need to do anything to an old tongue and groove floor before laying thinset and cement board? No other than be sure it is flat. what I do is switch to a 1/4 inch cement board or even Schluter ditra and the use a transition inbetween the two floors. there will still be a height difference but not as much. Can I install Cement Board over 2X4 floor support? Where is it that you would be installing this?